Father’s Day treats at Rue Beignet, Baton Rouge | Oh, the Places We See . . . 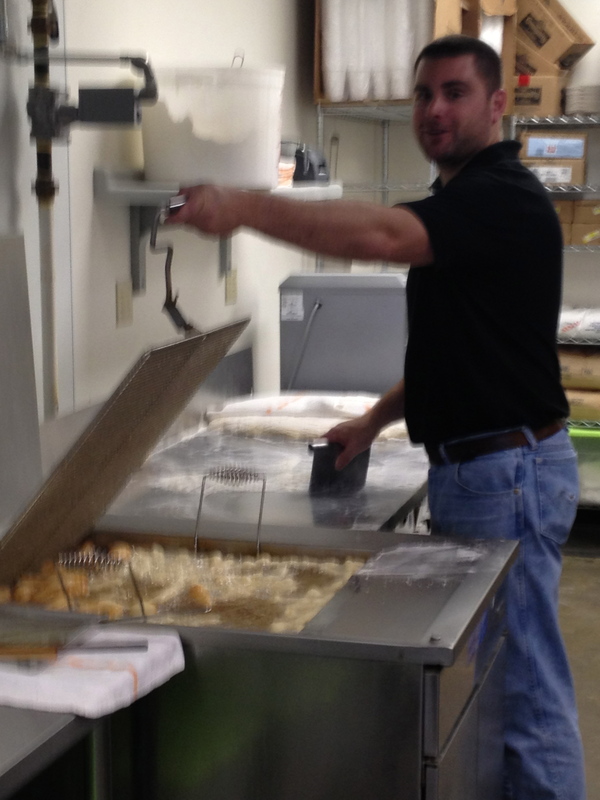 If you live in Tennessee, your trips to a beignet shop are few and far between. We just don’t have those flash-fried little doughnut pillows sprinkled with confectioner’s sugar nearby — or even within a day’s drive, if you live in Knoxville! 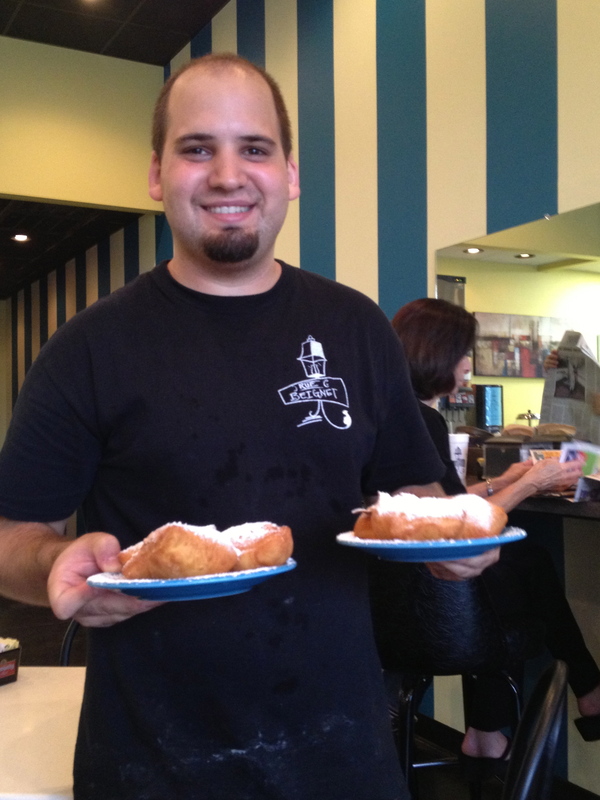 But since we were visiting relatives in Baton Rouge on Father’s Day weekend, I checked Yelp (Click here) for a listing of beignet shops in the area, and then “kidnapped” my hubby for a surprise visit to the number-one rated shop: Rue Beignet. It’s a clean little place — bright yellow walls, original artwork, a counter facing a wall of mirrors where folks sit on stools and may avoid (May, I said) covering themselves with a fine dusting of the white stuff that inevitably showers my lap whenever I take the first bite! 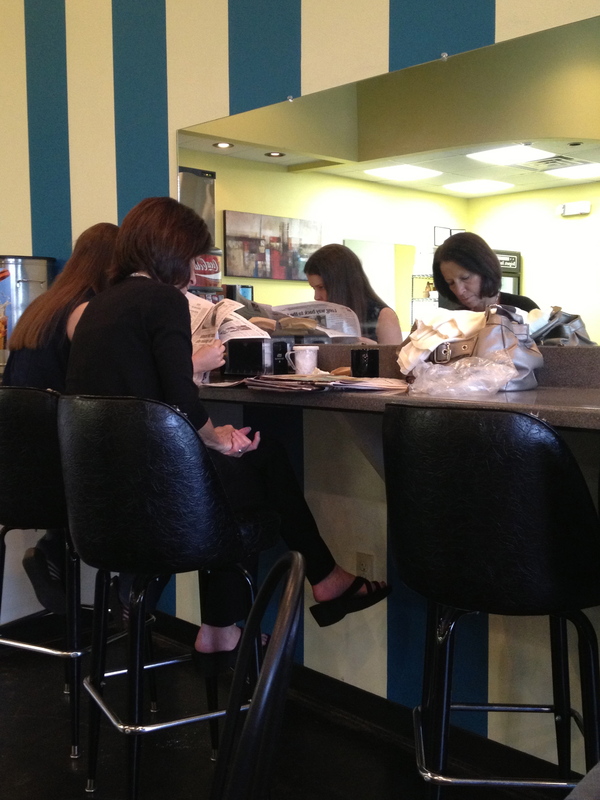 We lined up to order a plate of three sweet treats for each of us along with a café au lait. We were handed mugs so we could serve ourselves from a contraption I wish we’d had when we were first introduced to strong Louisiana java laced with cream at the Cafe du Monde (Click here) in the New Orleans French Quarter: a self-stirring contraption that kept the creamy, light brown café au lait hot and all stirred up and handy if you wanted more! I peered into the kitchen just in time to see owner Brent Sandrock rolling out mounds of light, cakey dough that he sliced and diced into squares and then plopped into the swirling oil. As you can see, I could hardly hold the camera still with that great smell wafting into the dining area making my mouth water for these rarely-gotten delicacies — so soft, so squishy, and so not beignets for very long! But before I could commence reading, a lady took out her very own apron, tied it around her waist, and got serious (very serious!) about the task at hand. 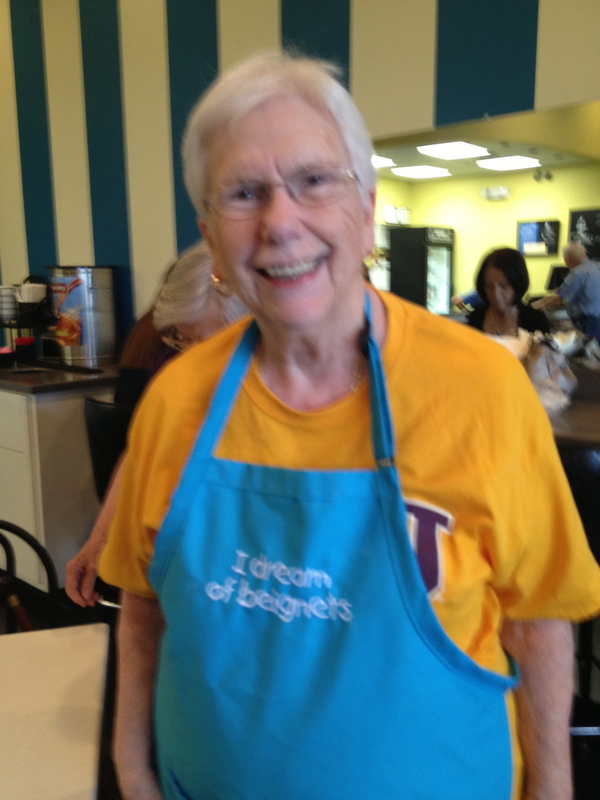 A true beignet aficionado, Claire Landry — whose name I learned later after we hit it off immediately — dines here regularly with her husband Larry and friend Jeannette. Although they were displaced from their home in New Orleans after Katrina, Claire and Larry have come to enjoy Baton Rouge — and breakfast at Rue Beignet! When the beignets arrived, we almost grabbed them from the waiter’s hands and then doused ’em with another liberal sprinkling of the white stuff. Don’t breathe in, I’ve always heard it said. (I guess you’d get a cloud of sugar filling up your lungs.) But I was also pretty sure I wasn’t supposed to breathe out either — unless I wanted to make Father’s Day a white-out event! 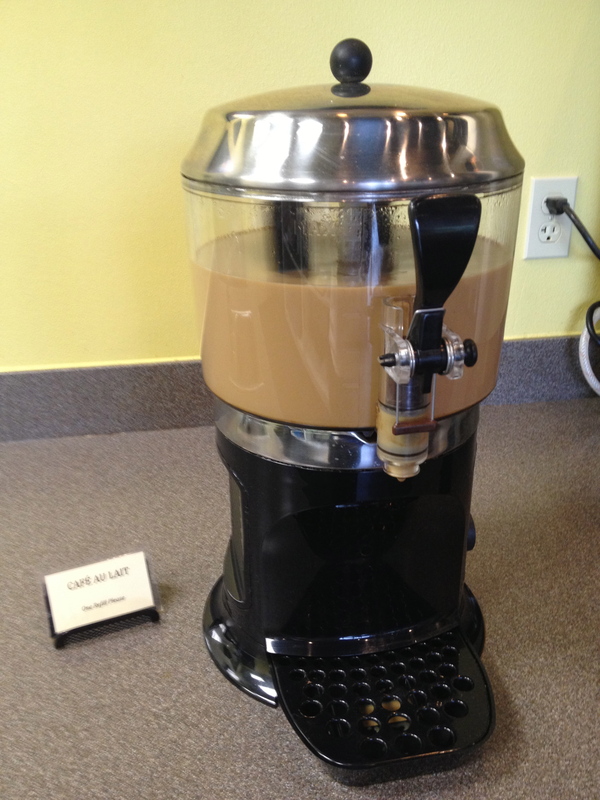 We savored our morning delicacies, sipped our café au lait and then said our good-byes. 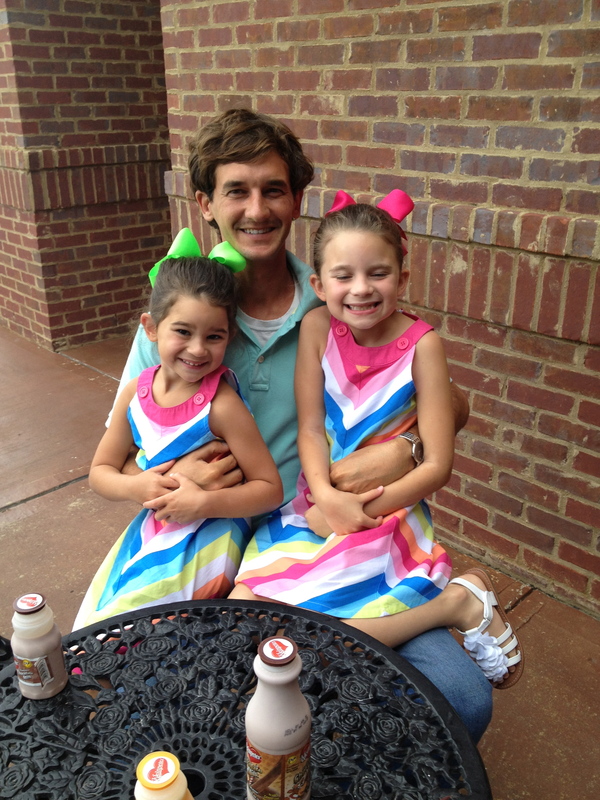 I couldn’t resist asking this proud papa if I could take a picture of him and his adorable daughters. (It was Father’s Day, after all, and they were taking their dad out for beignets.) The man gladly pulled them around him and said something we’ll never forget: I don’t know how I could have ever wished for a boy when I am so happy to have these two lovely girls in my life. 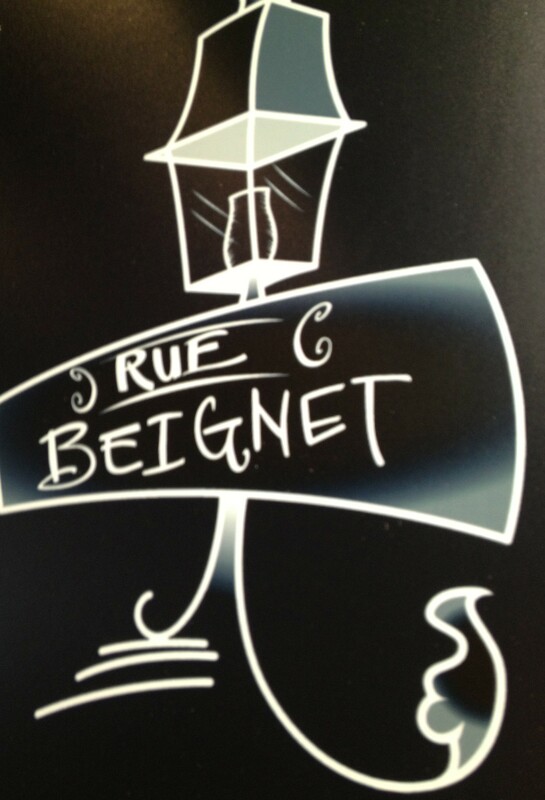 So, if you’re in Baton Rouge, stop by Rue Beignet and tell Brent hello. Order the always-good beignets or what we’re having next time — a heaping plate of beignet fingers (loads of little sugary squiggles instead of square pillows). But by all means, don’t forget your apron! This entry was posted in Food, Louisiana, Restaurant, Travel and tagged Baton Rouge, beignets, cafe au lait, food, Louisiana, restaurant, Rue Beignet. Bookmark the permalink. 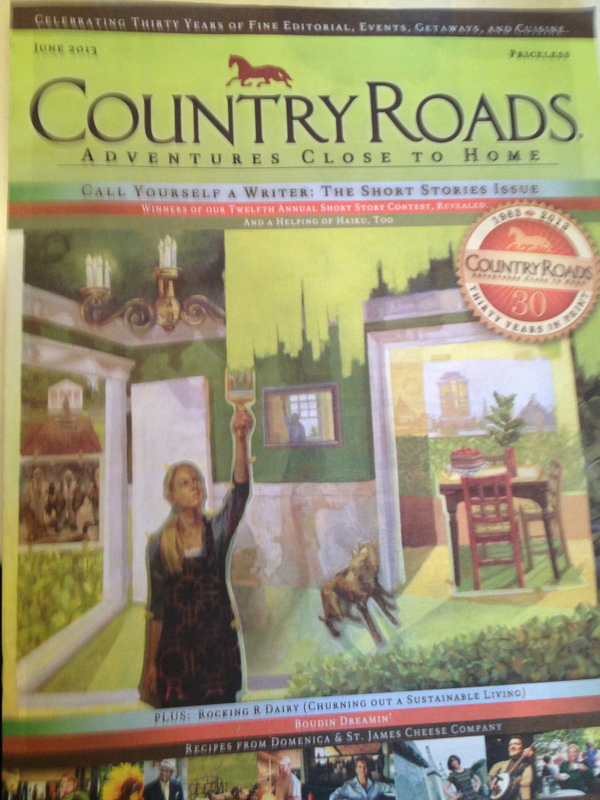 Hi Rusha…..loved your story! You need to come to Hawaii and have our malasadas! They’re of Portugese origin and very similar to beignets. Aloha from Hawaii, and hope all is well in Tennessee! Happy Summer! Kaylene, I would LOVE to come to Hawaii!! I’ve been to Maui, but that’s the only island. There is so much more I want to see. Where do you live? And thanks for stopping by. Coffee Call was always our go-to place for beignets. Still love CC — the atmosphere may have been a bit better. Can’t really remember — it was long ago! But I wanted to try a new shop this time. 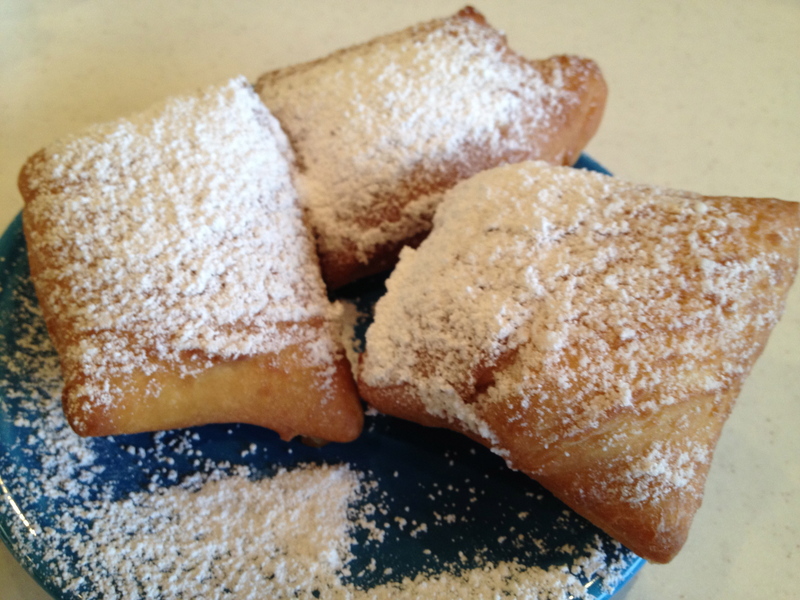 I think you’re right — there are no bad beignets! Thanks for commenting.